There are a lot of folks who are really working Twitter. They’re getting to 10,000, maybe 50,000 users as fast as they can….good for them. They use auto-follow and auto-unfollow tools and plan to turn that huge twitter base into cash. Frankly I think at this point in the twitterverse, that’s a fool’s game. Twitter has stalled at about 300M users. Why? I think it’s the fact there is too much commercialism and advertising, so it’s getting harder to build a really interesting community. Meanwhile, the big followings are being gained by existing personalities (celebs, etc). I think it will be phenomenally hard to become famous based on Twitter being your marketing arm, but I see lots of folks who seem to think they can. I can only imagine their twitter feed is nothing but a machine, run by machines, and most likely, it isn’t doing a damn thing for them. The Kardashians of the world have sewn up any commercial value in Twitter. 15 months and about 2 weeks after my last edit, I’m back at it. In the interim I spent a lot of time learning stuff for my new job, so now yes I know how to set up DHCP, LDAP and DNS and all that jive for a Linux network, and also learned Linux is a right royal PITA. But that’s beside the point. The main advantage to coming back to a manuscript after so long is you feel you have nothing to lose, and editing is that much easier. Getting this story down to the bones, ditching unwieldy plot devices cooked up in mad-genius fugue states, jazzing up the tension — all become so much easier when I thought it was dead anyway, so why the hell not? Since I married a woman who spent a few formative years in the U.K., and I’ve got friends there and even done some traveling in Old Blighty, we’ve got a few English terms in our lexicon. One is Boxing Day, traditionally the day the servants got the day off (and presumably ate the leftover Chinese from takeout boxes, hence the name*). A decidedly pedestrian bouche, not up to the usual standards. Except for the creatures, mostly done by the young ‘uns. We’re all pretty much tapped out on anything sweet, having ploughed through a mince pie, three panettone, the obligatory chocolate orange, and a bouche de noel (see right). We’re doing a bit more than that — I’ll be walking (!) to the liquor store to pickup a Glenfarclas 12 for review on the whisky blog. And we’ve got our charitable giving still to do (before the end of the year). The Syrians have got everyone’s attention and though we enjoyed the fruits of peace and enterprise here in the U.S., we’re keenly aware that the world is not yet the peaceful place we all hope for. Maybe it will be better next year. *Yeah, I’m b.s.-ing there, the real deal explained here. All I wanted was a mid-sized tablet for hanging out at breakfast & on the couch/in bed — and also take notes with a stylus, since I hate transliterating my awful handwriting after customer meetings. (I love my Surface Pro 2 but it is a bit heavy.) I had a $100 Dell promo gift card from a previous purchase which would expire on 7 Dec. I ordered VenuePro 8 5000 (64 GB, 2 GB RAM, sounded boss) on 9/30. The stylus arrived in a couple days, the tablet showed arrival of 12 Oct. Checked 12 Oct, showed status ‘canceled.’ No explanation nor email from Dell as to why. On Chat, 13 Oct, waited 50 min to talk to someone who re-ordered the tablet. assuring me it was still an orderable product. It was due to ship on 10 Nov. On 11/5, I see it is again delayed, by 7 days, to 11/12. Back into chat (after a 40-min wait); I ask for reason why & get “you went thru small/medium business, call another number” which after a 40-min wait is very annoying. On 11/12 I see it is again delayed by another week. I gave up on them ever sending it, or it getting canceled and my promo card expiring useless. Double-cross promises a long scorecard of unusual characters in a trying–and dangerous–game, spying for Britain in WW2. It delivers, both in the selection of outsized personalities and a build of the stories which is clear and engaging. Ben proceeds at a steady pace right to the end of the book, lingering on each personality and their adventures in turn. The individuals involved are shown in the context of an overall arc, the grand deception that led to D-Day. Although I had read much of that time, from diverse histories such as The Rommel Papers, I never knew what a part the British intelligence service played in that success of the Allied landing. Also, I found the denouement quite interesting and fulfilling, as MacIntyre presents the fates of his subjects in detail. Although I appreciate MacIntyre’s focus, I would have liked more texture about the British minders. There is less about the spymasters than the spies; more detail of the MI5 crew’s day-to-day lives, and indeed some description of setting would have been welcomed. Did they all work in the same building? Share coffee? Did they have class differences or were they a homogenous group? But that would have made the book longer. We have to assume MacIntyre provided as much detail as he had. Who will write in the 21st century? So, if we’re pushing to a new paradigm where the platform is the publisher, who’s doing the writing? Seriously, it’s already happening. CNN and ABC already incorporate users’ news feeds into their websites. CNN even enlisted the public to find Flight 370. When things happen faster than the big organizations can get a team on site, they appeal to the Crowd to supply coverage. When tough jobs defy computers, Amazon and others turn to the crowds to solve them. (Amazon cheekily calls their Mechanical Turk ‘artificial artificial intelligence’). So, we’ve already started down the road to using the Crowd to do a lot of jobs. With so many writers on the internet (seriously, check Twitter lately? everyone is writing a novel) writing is an obvious choice for crowdsourcing. How far will we go? Since about the 8th century (Han dynasty), people have been hired to go out and find the news, write about it, and either governments or publishers paid for their time and expenses. They hired editors to curate the focus of the publication and develop the writers’ ideas. It was (and still is) a huge business and makes money. Hence, multiple entrants. Result? Multiple publishers will carry the same story. They’re in competition. Competition is supposed to deliver a better product — but does it? I’d argue the products of the major news organs are homogenous. Apart from partisan sites and politics, for ‘general interest’ news stories we get a remarkably consistent product across major news organizations. 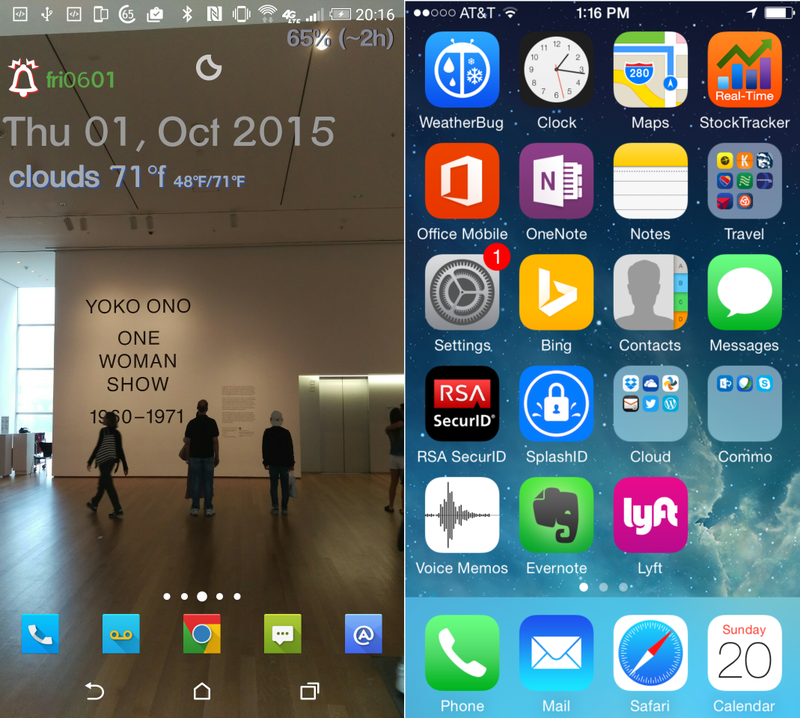 Ad-blocking in IOS will lead to the end of professional content creation. A bold statement? But follow thorough on Casey Johnston’s vision from The Awl — which I encourage you to read. It’s an insightful article, in which Casey goes back to some of the earliest controversies about ad blocking, and though recognizes the “significant consumer dissatisfaction” people have with blockers (she quotes an Oxford study), takes a pretty open-minded take on internet ads and explores the evolution of Internet advertisements. It isn’t a pretty picture, and ad blocking threatens the already insufficient advertising revenue of the NYT online presence. They get paid when we readers ‘click through’ an ad to the advertiser’s site. No ad, no click through, no revenue. I matched my Moto360 with the black SteelConnect lugs, and it’s a nice upgrade — I can use any 22mm band I want without any hassle or fear of cracking the back. So far so good. But a SteelConnect lug on an already large watch results in a really huge lug-to-lug measurement. IOW, more watch, less band. 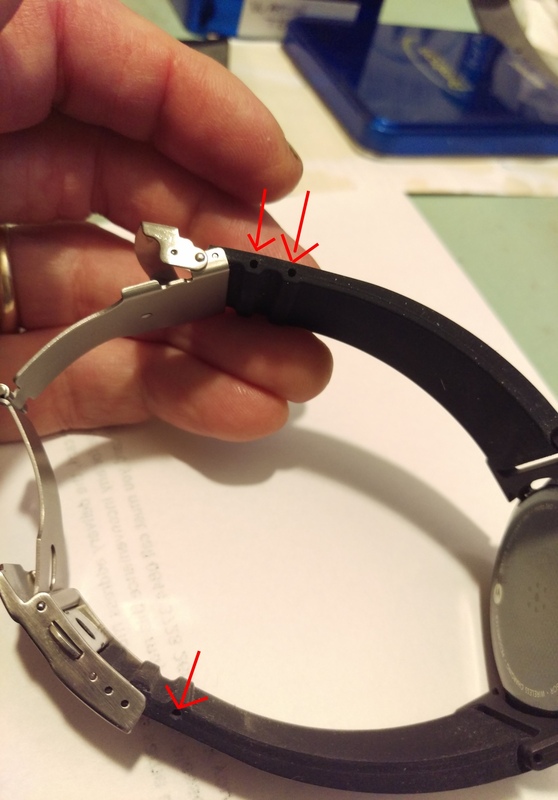 But the bands built for the Moto360 are designed a shorter lug-to-lug length. Result? If your wrists aren’t like Thor’s, you end up with way too much extra band. For example, the Tylt band wraps so far the endplate sticks out at an odd angle, and the Traser band tail wraps almost all the way ’round. So, what’s a watch enthusiast to do? Well, if you are in a similar predicament, head over to my favorite watch band site, Strapped for Time. They’ve got a humongous assortment of bands, arranged by width, and also give you information like how long each strap is, in mm. 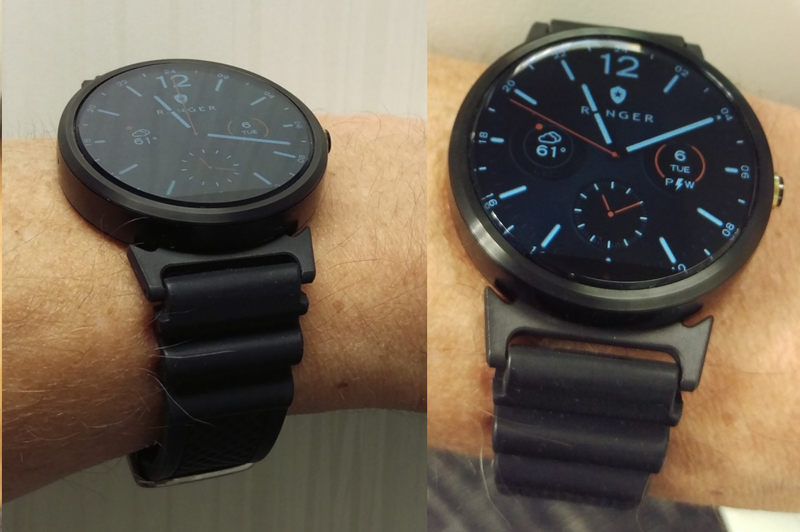 The original Moto bands are 127mm and 80mm. So, 207mm total length, and if your wrist is in the 7 to 7.5-inch range, you’re going to want a shorter strap for the SteelConnect. Hadley Roma silicone band. That is real stitching. I like a silicone band, as I don’t have to worry about the band getting wet in day-to-day activities. There are not a whole lot of silicone options, but I found a couple excellent choices. First, the Hadley Roma silicone. A photo is shown at right. At 125/75mm it’s 7mm (about 1/4-inch) shorter than the standard Moto band, and fits me perfectly. The styling is superb, with real stitching in various colors and ribbing on the underside to keep it comfortable on a hot day. Also, the lug end has a notch to fit in with the flare of the lugs. Another approach is a trimmable band. I’m familiar with Oris watches, as I’m a watch guy and my wife bought me one for a major anniversary. They’ve got a Formula-1 themed watch with a black silicone band, and Strapped for Time has a version of this band here. The thing about this band is that it is a deployment band. The ends that snap into the deployment can be trimmed, as there are multiple lug points. Check out the touched up photo below, showing the adjustment points. This band adjusted nice and snug on me and still had a long ways to go. You have to take care trimming, use a very sharp exacto-type blade and go straight. One item to note: although this band works fine with the Moto bedside charger that comes with the watch, it does not work if the watch needs to lay flat, like your typical Qi pad. Bring a beside charger when you travel. Oris-style band with adjustment points. As you can see, the silicone bands pick up dust, and that’s highlighted in the photos. In real life it’s not as noticeable, but if you’re particular about that and don’t need water resistance, SFT has plenty of leather options as well. So, that’s the story for the original Moto360 and SteelConnects. I consider them a major upgrade, as my first watch cracked badly after using the Tylt for a couple months. Changing bands is far simpler and the freedom to put any band on there is great. 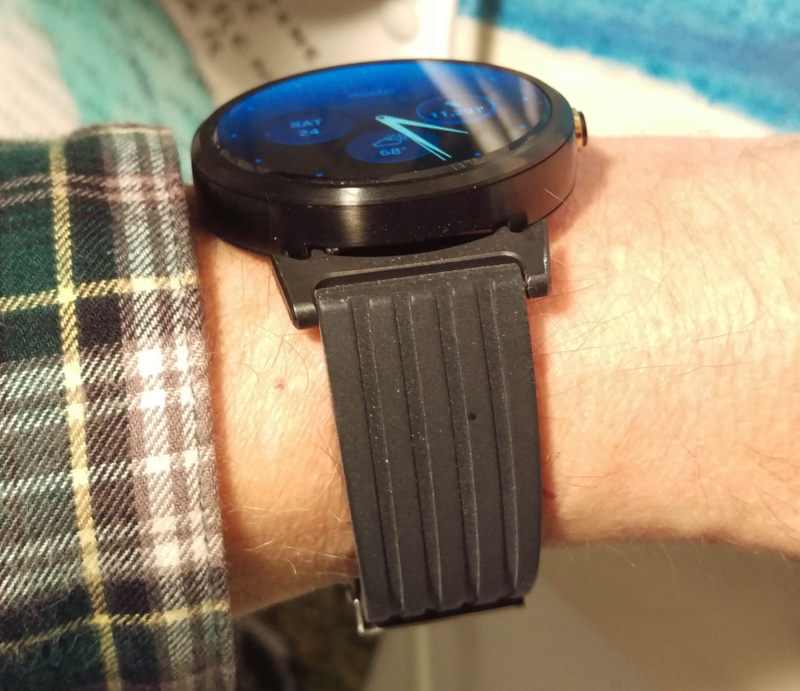 There is no way you’d be able to fit the beefy Hadley Roma on the original Moto 360 without the ‘Connects. Worth a go. The new Moto is out and I’m tempted just from it’ newness to give it a go but the OG Moto is still doing the job. It works well with the new interactive watchfaces, and with the SteelConnect I have the style I want. Just a quick update – I received my SteelConnect lugs yesterday — the ZPJ folks are great international sellers. They keep you informed and offer an expedited shipping option, which I took. I’ll have an ‘unboxing’ post later this week. Meanwhile, here are some photos of the SteelConnect with a Traser watch band (which I got off Ebay IIRC). 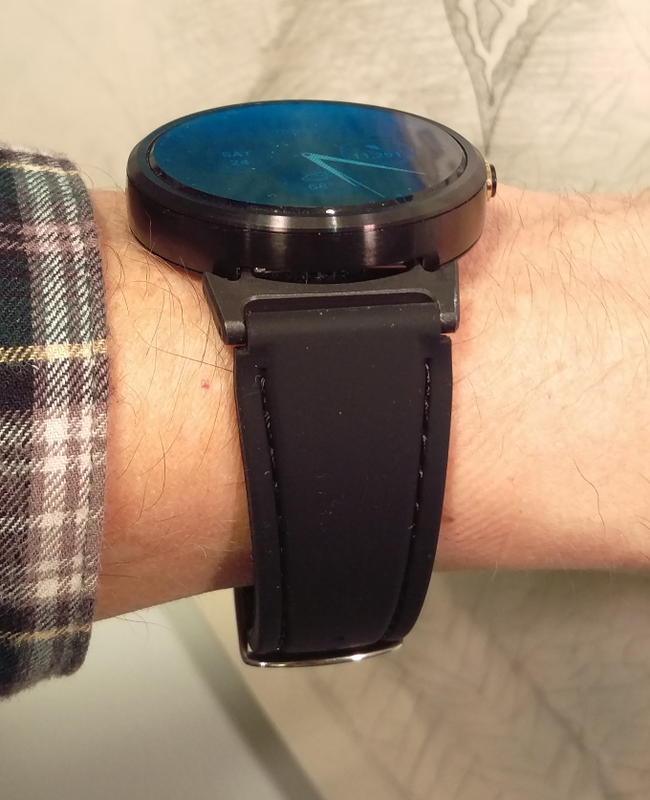 Traser is a traditionally-styled watch, so the band works better on the Moto360 with SteelConnect than bands designed for the Moto360’s lugless design, such as the Tylt. That’s because without lugs, Moto had to extend the band’s length. The Tylt is too long for me with the SteelConnect lugs installed, and the buckle ends up creeping up the side of my wrist. As looks go, the Traser has a nice flare as it meets the lugs. 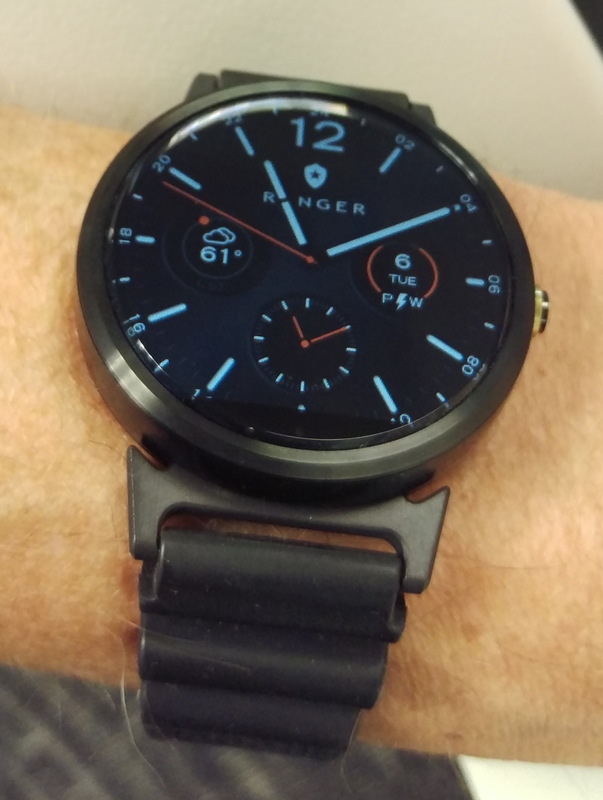 My Moto is sporting the Ranger watch face from the folks at Zuhanden, another great design from those folks. I think the Ranger works well with the macho styling of the Traser band. BTW, Trasers are great watches. Tough,and never go dim. Radioactive!